Paneer lovers rejoice! Here’s a delicious and creamy restaurant-style matar paneer recipe that you’ve got to check out. 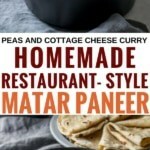 What exactly is Matar Paneer? 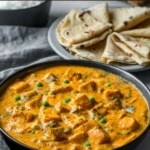 Matar Paneer recipe combines green peas (matar) with cottage cheese cubes (paneer) in a creamy tomato onion based gravy. I prefer using nuts instead of cream since you also get the added benefit of vitamins, minerals, and antioxidants in your meal. It doesn’t matter if you serve it over rice or with rotis – it is delicious either way :-). The two main steps are: making the base masala and then adding peas and paneer to it. Add 2 tablespoons of oil to a wok kept on medium heat. Add onions along with salt and when they start to soften, add ginger, garlic and green chilies (if using). 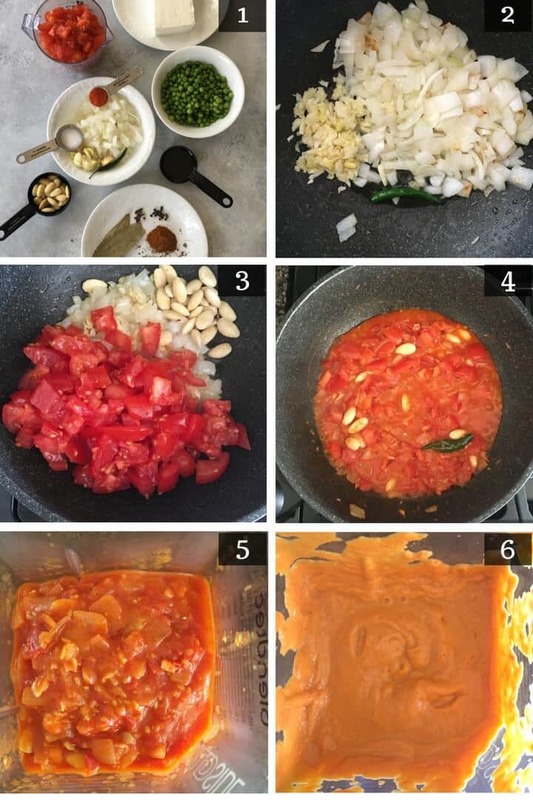 Fry the mixture for a couple of minutes and then add tomatoes and blanched almonds (or cashews), if using. Continue to cook the tomatoes until they turn soft and mushy. Add chili powder and mix well. Add 1/4 cup cold water to this mixture and mix well. Let it cool down for 5-10 minutes before transferring it to a blender. Grind it into a fine paste and set it aside. 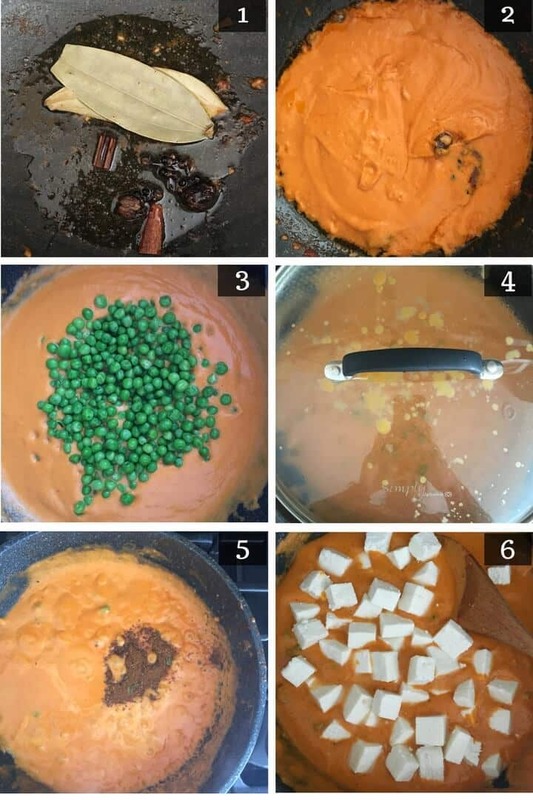 Add the ground paste and mix it well. Stir in the peas and cover the lid. Let the mixture come to a boil. Once the mixture comes to a boil, add garam masala along with the sugar (if using) and mix well. Add paneer and gently stir it in. Let it simmer for about 5-6 minutes. Add cream (if using) and stir it in. DO NOT use both cream and nuts – pick one. It is an overkill, not to mention unnecessary calories. Garnish it with roasted fenugreek leaves (kasoori methi) and/or coriander leaves. The non-creamy version – Do not add almonds or cashews. Skip the cream as well to make it a lighter fare. 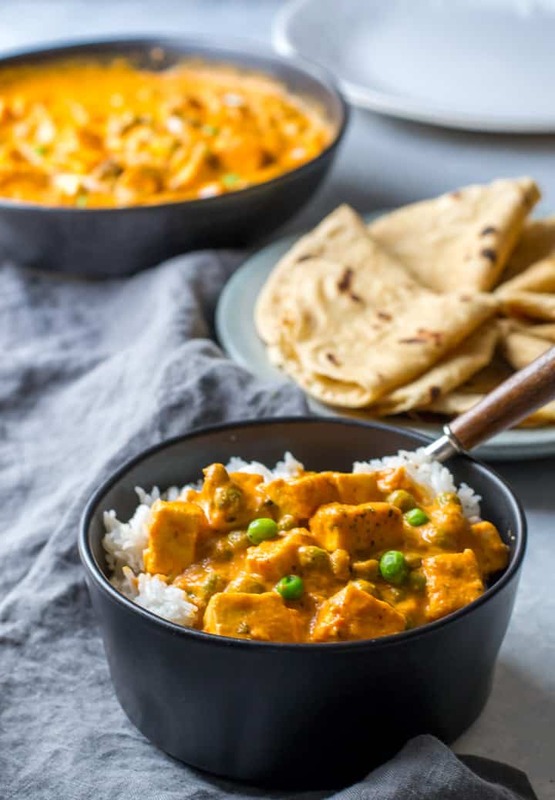 Vegan version – Add Tofu instead of paneer for a vegan version. Garnishings – Garnish it with only coriander instead of roasted kasoori methi. You can also use both. Use butter or ghee instead of oil for a richer version. Without whole spices – I love the flavor that the whole spices infuse into the oil but feel free to skip the spices (bay leaves, black peppercorns, black cardamom, cinnamon stick and cloves) if you don’t have any. The dish tastes great without it as well. Enjoy this finger-licking dish with warm rotis or rice. 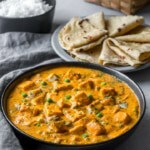 If you love paneer, you gotta check out this Paneer Makhani recipe or my favorite Palak Paneer recipe. You can’t go wrong with either of these. Paneer lovers rejoice! Here's a delicious and creamy, easy restaurant-style matar paneer recipe that you've got to check out. Add 1/4 cup cold water to this mixture and mix well. Let it cool down for 5-10 minutes before transferring it to a blender. Grind it into a fine paste and set it aside. Add the ground paste and mix it well. Stir in the peas and cover the lid. Let the mixture come to a boil. Once the mixture comes to a boil, add garam masala [along with sugar, if using] and mix well. Add paneer cubes and gently stir them in. Let it simmer for about 5-6 minutes. Add cream (if using) and stir it in. Garnish it with roasted fenugreek leaves (kasoori methi) and/or coriander leaves. I love the flavor that the whole spices infuse into the oil but feel free to skip the spices (bay leaves, black peppercorns, black cardamom, cinnamon stick and cloves) if you don't have any. The dish tastes great without it as well. You can add 3 tablespoons of cream instead of cashews or almonds. Make sure to add the cream at the end just before serving. Wouldn't advise using both cream and nuts. Blanching almonds - Soak raw almonds in boiling water for about a minute. Drain them before soaking them in cold water for about a minute. Squeeze the almonds to peel the skin off. For a hint of sweetness, add a teaspoon of sugar. Totally okay to skip it! 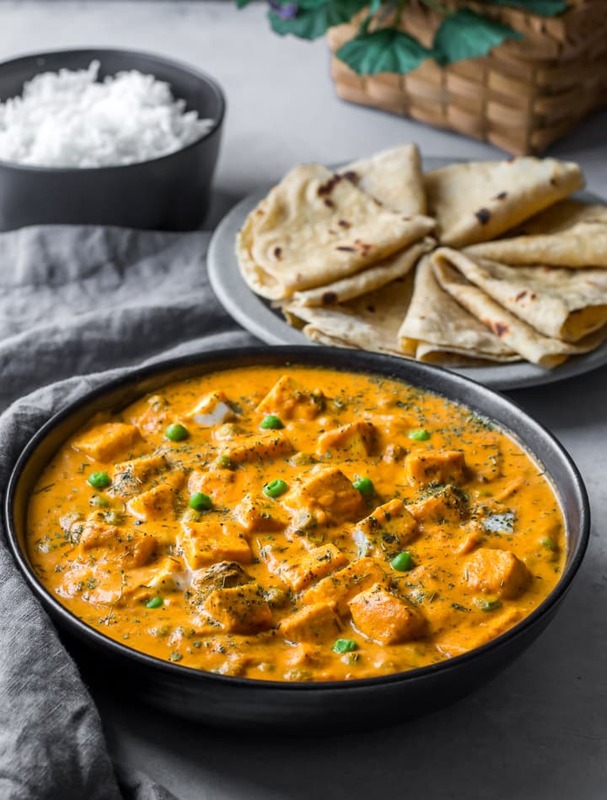 For soft, melt-in-the-mouth paneer, microwave the paneer for 30-60 seconds before adding it to the curry. They should be spongy to touch. NOTE – I am not a registered dietitian or nutritionist. Nutritional information is provided as a courtesy and can vary depending on the exact ingredients you use. This looks amazing!! I CANNOT WAIT to make it and would love to try a potato and peas version! 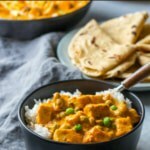 What are your thoughts on combining the potato part of your Aloo Mutter with this recipe or do you have a suggestion on how to replace potatoes for the paneer? Thank you Anu! Thanks for stopping by, Becky. Matar Paneer is a richer, creamier gravy compared to Aloo matar. Aloo matar is more like an everyday meal. Having said that, feel free to replace paneer with chopped and precooked potatoes.